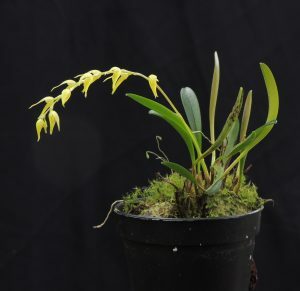 I am surprised to find that this is the first time we have posted one of our favourite miniature pleurothallis species. As the name suggests this species is found in Costa Rica where it grows in wet forests from 600-1800m. It also grows in Panama. We find the species quite slow growing and so it stays really small making it perfect for those who grow their orchids in terrariums or orchid cases. We find the species is very happy mounted or in a tiny pot (3cm here) and kept well watered all year.